I used to document what bubba and I got up to but realised that I haven't done this for cub. Now Bubba is in full time school I have more time alone with my boy. Every afternoon and then two whole days together. Until a few months ago I had never been to a playgroup as Bubba and I always had a full quota of things to do. For research I took cub and after a while to warm up, he loved it and it's really nice to watch him playing and exploring. 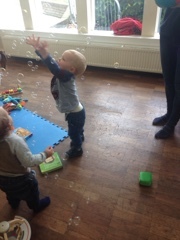 So we've been going every week, we also go to one structured class where he doesn't necessarily join in the song time (looks at me as if I'm insane as I sing) he loves running around, the musical instruments and bubbles...oh my boy loves bubbles. Apart from that we sometimes just go to the supermarket and have a spot of lunch on the days I work. I'm still at the feeling guilty, like something or someone is missing stage. I miss having my girl around chattering away at me. I'm getting to know him in such a different way and get to concentrate on his cheeky little personality and quirky mannerisms. At 18 months he is into everything and is starting to have proper tantrums, sometimes I can't even look at him mid hissy fit as that sends him into a bigger tantrum. But that's a whole different blog post for another day. He loves climbing and being outdoors so on the days we aren't doing anything we probably spend 20 mins in the front garden (as soon as I lift him out of the car). 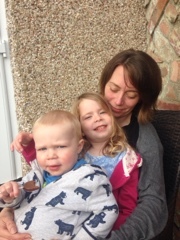 Then at some point we end up in the back garden where he invariably gets muddy...it's like he attracts dirt and muck, so very different from his big sister. The best bit is picking Bubba up from school, he gets so excited in the playground as we wait and there is lots of squealing from them both.